A newly discovered asteroid is heading for the earth, but don't panic just yet. In 2011, NASA's Wide-field Infrared Survey Explorer (WISE), a space telescope that had been actively detecting astroids since 2009, was placed in hibernation after completing its mission. But last August, NASA reactivated the device for another three-year assignment and WISE quickly uncovered some distressing news. NEOWISE, the telescope's new moniker, identified a near-earth asteroid called 2013 YP139. The object was confirmed by the University of Arizona, Kitt Peak National Observatory in Tucson, and an amateur astronomer at the Great Shefford Observatory in Berkshire, England. NASA estimates that the asteroid is about 0.4 miles in diameter. For comparison, the meteor that exploded over the Russian city of Chelyabinsk last February was roughly 65 feet. Thankfully, researchers expect YP139 to miss the earth by about 300,000 miles. Plus, its currently 27 million miles from the earth, which means that it won't reach us until our great-grandchildren are running the show. 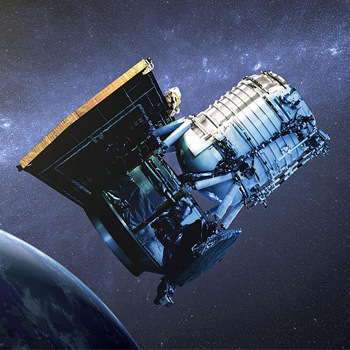 Amy Mainzer, NEOWISE's chief investigator, is enthusiastic about the project's early success. "We are delighted to get back to finding and characterizing asteroids and comets, especially those that come into Earth's neighborhood," she said. "With our infrared sensors that detect heat, we can learn about their sizes and reflectiveness." During its original mission, WISE found more than 34,000 asteroids and characterized 158,000 throughout the solar system. So, over the next three years, its probably safe to assume that you're going to read a few more alarmist news stories like this one. Also, I'd like to point out that I didn't make a single Bruce Willis joke in this article. That kind of self control is unheard of among internet writers.